Case maker NZXT continues to find ways to milk its fantastic H440 mid-tower design. It's been tweaked and modded into different special edition versions, including the Designed by Razer variant with Razer's logo and a green under glow, and a themed version based on Team EnVyUs. Now there's a version for CS:GO fans who dig the Hyper Beast weapon skin. The new H440 Hyper Beast is being limited to a production run of 1,337 (of course) units, each of which will bear a uniquely numbered metal badge. More importantly, they'll all feature the Hyper Beast graphic that Brock Hofer designed as a weapon skin for the CS:GO M4A1-S.
"Being gamers at heart, we know how passionate gamers can be about their favorite titles. And even more so with the rise of in-game items customization featuring intensively sought-after rare skins. That’s why we decided to work with Brock Hofer to help CS:GO fans turn their favorite virtual skin into their own very rare build. 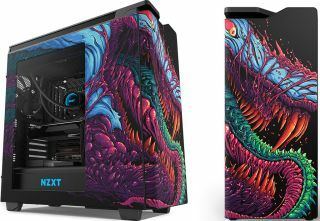 With H440 Hyper Beast one can say that the beast is truly unleashed," says Johnny Hou, NZXT’s founder and CEO. As a refresher, the H440 supports 240mm, 280mm, and 360mm liquid cooling radiators in the top and front. It comes with four case fans, including three 120mm in the front and a 140mm in the rear. The H440 is actually a pretty nice case. It made our list of the 25 best cases for your next PC build, though that decision also factored in the price—it can be found for around $120. There's a premium attached to the H440 Hyper Beast, which is priced at $200 (€200). If you're into this thing and are willing to pay the up-charge, you can place your pre-order on NZXT's website (it ships in late November).